Why cancer is different in children? The diagnosis of cancer in a child is very painful and difficult to digest for the whole family. After a strong emotional impact almost immediately questions arise regarding therapies used, side effects, methods of administration, child welfare, etc. The types of cancer that develop in children are often different from the ones that develop in adults. Unlike many cancers in adults, childhood cancers are not strongly linked to lifestyle or environmental risk factors. Their causes are still unknown in many cases. So at present it is impossible to take preventive measures towards its occurrence. Childhood cancers are different also in the kind of neoplasias that they develop. Children develop tumors in the hematopoietic organs (organs producing blood elements) and the lymphatic ones (leukemias and lymphomas), and in the tissues forming the nervous system (brain tumors, neuroblastoma ...) and supporting tissues as bone or muscle (sarcomas). About 75% of all children's tumors can be cured (another major difference with adult tumors) with the treatments that exist today and more than 80% of children who develop cancer are cured. But, are children with cancer really cured? YES, cancer cure means that children with cancer will grow up to be adults with complete potential. Why choosing at Sant Joan de Déu - Barcelona Children's Hospital? Highly specialized healthcare attention. The Barcelona Children's Hospital integrates professionals with the utmost dedication alongside the latest technology. This effort allows us to offer the best results in contrasting ways. Being a pediatric hospital offers the benefits of having the support of essential pediatric specialties in cancer patient care such as cardiology, orthopedic surgery, neurosurgery, oncological surgery, interventional radiology, psychiatry and psychology, rehabilitation, pharmacology, nutrition, endocrinology, social work, dentistry, ophthalmology, otolaryngology, and critical care. Access to cutting-edge treatments. In the hospital we have integrated specialists from international centers, pioneers in the treatment of cancer, to provide new treatments. All our cases are evaluated with them and our decisions are contrasted with specialists from these centers. These partnerships allow us to use treatments that are in a research phase. Integrated Research Laboratory. Since 2003, our hospital has a research laboratory for children's cancer, integrated with the care team, where oncologists and researchers work together to develop new forms of diagnosis and treatment and better prognosis prediction systems for our patients.This research has a direct impact on our patients and allows better categorization of tumors, better definition of the extent of tumors and the size of metastases, and a better choice of treatments. Supportive assistance programs. 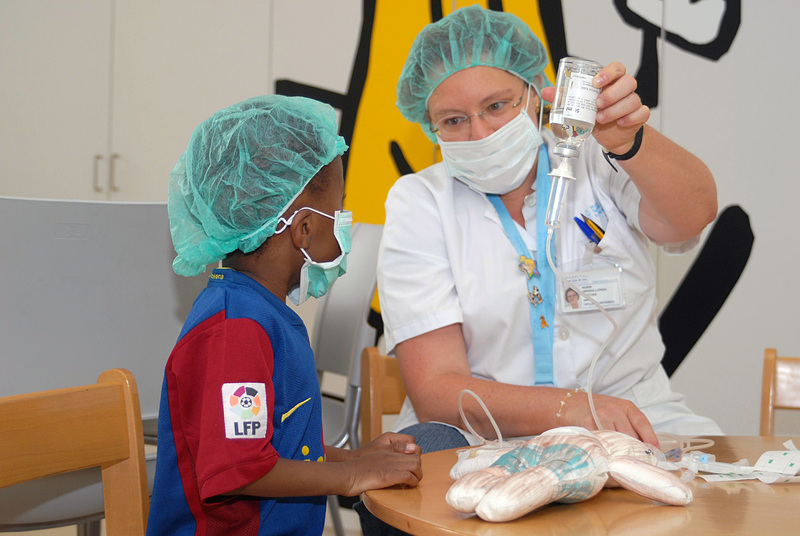 In our center we have nurses specialized in the management of children with cancer, an essential element in the quality care of these patients. Our patients also have single rooms for their comfort and their family's. All painful manipulations of the patient, such as bone marrow punctures or lumbar punctures are performed under anesthesia in the ambulatory surgery unit, which prevents unnecessary pain and anxiety to the patient. 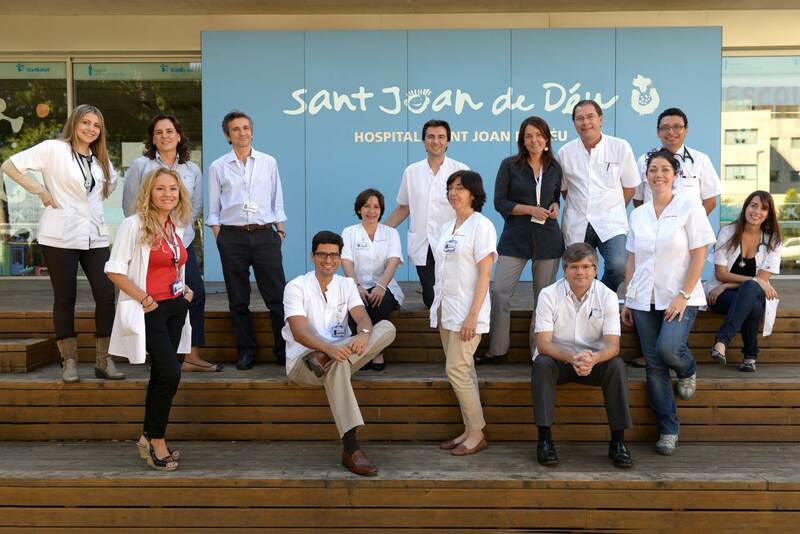 What tumors are most frequently treated at Sant Joan de Déu - Barcelona Children's Hospital? Retinoblastoma: It is the most common eye tumor in children. It originates from the developing retina and usually occurs in patients from 0 to 3 years of age. The Sant Joan de Déu-Barcelona Children's Hospital has been the first center in Europe to offer intra-arterial chemotherapy for retinoblastoma which preserves the eyes of the patients. Neuroblastoma: It is most common solid tumor during the first 2 years of life. It originates in the peripheral nervous system and its prognosis is highly variable, depending on the characteristics of each case. The hospital has achieved a 3-year survival rate of 68% for patients with high-risk neuroblastoma. This level is 20% higher than the European comparative studies. Osteosarcoma: is one of the most common forms of childhood cancer, comprising approximately 20% of all primary bone cancers. It originates more frequently in the metaphyseal region of tubular long bones (femur, tibia and humerus). Less cases occurring in the skull and jaw, and in the pelvis. Ewing Sarcoma: Malignant neoplasm of the development of bones and soft tissues, usually seen in patients between 10 and 20 years of age. The cure rate is of 84% for patients with localized Ewing sarcoma, at the same level with the best hospitals in the world. Leukemia: It is the most common childhood cancer. It appears when the white blood cells become malignant or cancerous cells. Brain tumors: these are the most common solid tumors of children. They are characterized by the abnormal growth of tissue that make up the central nervous system, located within the skull or spinal canal. An MRI of the brain and spinal cord is the main test to display this type of cancer. They are usually removed by surgery. Depending on the type of tumor, treatment should be supported by radiotherapy or chemotherapy. The Hospital is one of the first centers in the world to perform a biopsy brain stem tumors in children (DIPG). Wilm’s tumor: is a cancerous tumor in the kidney cells. Treatment includes surgery, usually at first, and then chemotherapy. The chances of cure of this tumor, even with metastases, are very high. Lymphoma: This name includes differents kinds of cancer of the lymph nodes. They are unlikely to appear before the age of 5. Lymphomas are cured with chemotherapy. If you wish to know more about your child’s condition, please complete the form and we will put you in contact with the specialists. We can provide the help you need to overcome your child's disease. Should you wish to know more about these procedures please contact us at info@medabcn.com with your request or complete our 'Contact form' today. You may also call us to the phone number +34 93 595 25 71.